Connecticut’s Appropriations Committee on Monday approved an arbitration award for Connecticut’s unionized assistant attorneys general which will cost the state $3.3 million in salary raises, benefits and bonuses. The contract award was won through arbitration after negotiations with the state broke down, but the award still requires a vote by the General Assembly. According to the Office of Fiscal Analysis, the AAGs will receive two general wage increases of 3.5 percent, plus two annual increment wage increases of 2 percent, for a total wage increase of 11 percent over just two years. Annual wage increments are typically closer to 3 percent, according to testimony submitted by the Office of Policy and Management. The contract also awards a $2,000 lump sum payment or, for employees at the top step in the state’s salary scale, a lump sum payment based on 2.5 percent of their annual salary. Furthermore, department heads – which constitute a separate bargaining unit – will receive a $6,000 stipend in 2020 and a $12,000 stipend in 2021, which reflects “the deficiencies in the job classifications that fail to recognize the complexity of the work borne by the Department Heads,” according to OPM. The OFA notes there were no wage increases for AAG’s between 2017 and 2019, and the bonuses and salary increases are equivalent to the wage increases outlined in the 2017 SEBAC agreement, negotiated between Gov. Dannel P. Malloy and state union leaders. The 2017 SEBAC agreement awarded all state employee union members two 3.5 percent general wage increases, along with annual increment increases and a $2,000 lump sum bonus. 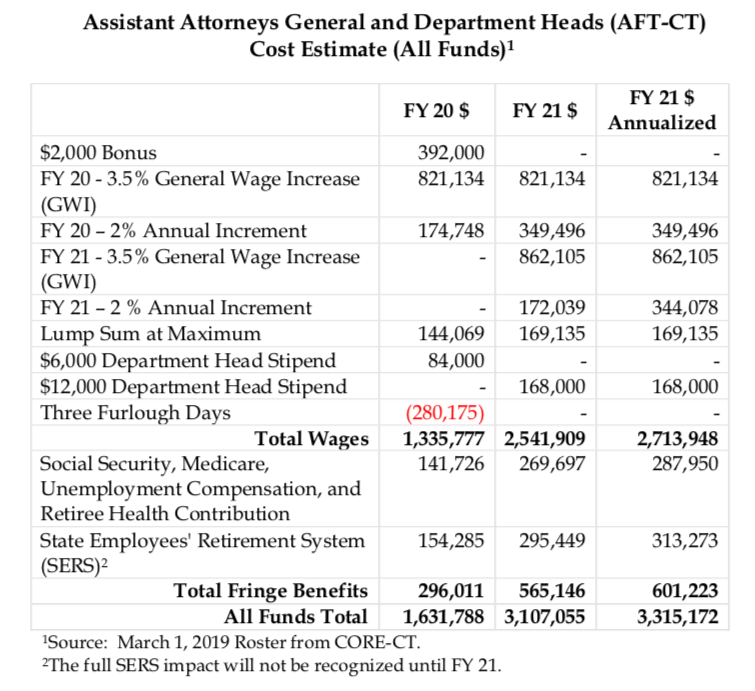 The total cost of the SEBAC wage increases is estimated at $353.8 million, according to OFA. Testimony submitted by the AAG bargaining unit leaders to the Appropriations Committee said their salaries had effectively been cut over the year because of the rising cost of employee benefits. “In fact, all members have effectively had salary decreases over the past ten years because of increased contributions towards their employee benefits while salaries remained stagnant,” the heads of the Association of Connecticut Assistant Attorneys General wrote. The AAGs and AAG Department Heads constitute two separate bargaining units totaling 196 employees. Both units are represented by the American Federation of Teachers. The AAGs voted to unionize in 2016 over fears of staffing cuts related to Connecticut’s budget problems. The arbitrated agreement will now head to the General Assembly where it will likely be passed with strong backing by Democrats. The Appropriations Committee vote was divided largely along party lines, although Democratic Senator Joan Hartley, D-Waterbury, broke ranks and voted in opposition. However, under Connecticut law, even if the contract is rejected by the General Assembly, it can once again go to arbitration in which the arbitrator’s decision will be final. This article has been corrected. Rep. Joshua Hall did not vote on the contract. I’m a retired state employee. I gave 27 years of service to our state veterans. When I accepted the position I took a considerable pay decrease. I’ve had to swallow raise freezes, mandatory furlough days, and double duty responsibilities because of hiring freezes throughout the years. I’ve paid my dues believe me. The problem lies in top heavy administrations throughout the state agencies. The general public doesn’t know that. Time to drain the swamp.